The last several days have been awfully challenging to be a citizen of this world, let alone a citizen in Florida. Like so many of you, the recent Orlando tragedy has both shocked and saddened me, but I am proud to see that the quilters of the Orlando MQG are banding together to try to bring comfort to those affected by this tragedy, the best way we know how: quilts. The Orlando MQG is collecting heart blocks and quilts of heart blocks for the victims, victims' families and first responders. There's a very simple heart block tutorial from Cluck Cluck Sew you can use right here, or if you're not a fan of stitching and flipping you can download my new free heart paper piecing templates right here or via Craftsy. There's no cutting instructions on these templates, they are strictly templates, but they're extremely simple and easy to use. While you may say, who needs quilts in Florida, you'd be surprised how many my family piles on in the wintertime, not to mention how much joy a quilt draped across a couch can bring. There's loads of ways to get involved if you don't want to make blocks or quilts, and you can check out all of the details right here: The Orlando Modern Quilt Guild. , and the Spring 2016 issue featuring the quilt, pattern and an article about paper piecing by yours truly has finally hit the stands. You'll find my Circus Star quilt pattern on page 40 of the magazine, with my article on paper piecing just before that on page 36. The Circus Star totally reminds me of the multicolored patterns you see on circus tents and such, and yet also gives off a kaleidoscope kind of feel. It's a three template project, and has loads of possibility. It could easily be done in a color wheel kind of style, or even in grayscale, and be really and truly stunning. , has started to ship a whole month early, and I'm so excited!!!! I'm incredibly proud of this book, so I wanted to take a moment this morning to show you a few sneak peeks of some of the things I love most about it. I love the photography. I gave my publisher, Interweave, a "mood board" to work from, trying to give them an idea of the style of photography I hoped to see in the book and oh boy, did they deliver. Absolutely the look and feel I had hoped for! I love the amount of me that's still left in the text. The amount of personality that didn't get edited out. I think my voice really comes through in the writing, and that's really exciting to me. I love the amount of illustrations and photos throughout. It makes the book so much more vibrant.
! Stay tuned for more, and have a fantastic day! So, I mentioned last week about my hare-brained idea to make this epic sampler quilt before the baby is born, and I've gotten right to work on it. Combined with my Twirl block from last week (download the free tutorial right here! ), I'm up to a total of four blocks thus far. Here they are in all their glory! Each of these blocks will be 6" finished in the quilt. There are three different block sizes that I'll be making throughout these next many weeks - 6" finished, 12" finished, and 18" finished. There's seventeen 6" blocks, twenty 12" blocks, and two 18"blocks to make. This week's three new additions are The Claw, the Friendship Octagon, and the Economy block. The Claw is a fairly traditional block known often as a Capital T block. I paper-pieced mine, although it's absolutely doable without that. When I get down to 6" blocks with this much patchwork going on, I often opt for paper-piecing to insure as much precision as possible. I love the shades of teal going on in this block, and it really solidified my choice of the fab Botanics Leaves print for my primary background print. There will be two other background prints that I'll use in some of the blocks, but the bulk of the blocks will use this print for the background. The Economy block is one I've made many times over, for lots of bees, and I've even made a pillow top for my home using the block. I used a deep, dark shade of fuchsia for the outside accent frame, and I just love the addition of this beautiful, rich fuchsia to the blocks so far! I have to say, this photo doesn't exactly do it justice, in spite of my photo editing attempts - today marks the 22nd day in a row of rain where I live, and the lack of sunshine has made photo-taking really difficult! This block is also easily achievable through traditional piecing, but I much prefer paper piecing when dealing with all those bias edges, so I paper pieced this bad boy. Happy Monday to you! First off, thank you all so much for your kind words and congratulations about our baby news last week! It's such an exciting time, and your lovely comments really made me smile. Speaking of smiling, I'm really enjoying trying to get back into a regular schedule of blogging as of late. I missed blogging! Don't get me wrong, I love Instagram and sharing a quick snap here and there, but I miss words. I love words :) So here I am, and hold me to this, but I'm going to try to blog every Monday for the rest of the summer. Surely that will be long enough to build a new habit, right? Here's hoping! You can download this block tutorial from Craftsy, for free, right here. For those of you who don't use Craftsy, you can download the tutorial PDF directly here. The best part about putting together this tutorial is that I've managed to bundle it into this new crazy idea that I've had. A 39-block epic sampler quilt with boatloads of patchwork and paper piecing, in different block sizes and loads of color...that I plan to finish before the baby is born. I know, I'm crazy, but I need a big, long-term project to channel my energy into in my "free" time, something that makes me happy, that I can work on bit by bit, and I think this is it. I've designed the quilt using some blocks that I've made in the past, and lots that I've designed and just not had the right project for, and others still that I've just always wanted to make. And my goal is going to be to finish at least two blocks a week from now until the first week of January when the baby comes. Based on my calculations, that will definitely yield me at least all the blocks to finish the quilt top before the baby comes. It's entirely possible that the Epic Sampler quilt will become a new block of the month club, if I can manage to sort it all out properly and figure out how to break 39 blocks into a 12 month experience. What say you, blog-land, would you be interested in a new club, one that mixes paper piecing and regular old patchwork piecing? Wow, December has arrived, friends! Time for a new Lucky Star, the last in the 2014 series. The Persnickety Star is a really unique paper pieced star, with an interesting, irregular frame around the star to draw you into that center star, and some additional star points around the frame for extra pop. It may look like a lot of pieces, but it comes together surprisingly easily! It's all paper piecing all the time these days in my sewing room, and this weekend I finally finished off a little pattern that's been half-finished for an embarrassingly long while, the Coffee Cup block. This is a mini-pattern, available as a PDF pattern now both at my Pattern Shop and Craftsy. There will be a few other mini-pattern releases over the next few months. Every mini pattern will include a paper pieced block template in two sizes, in this case 6" and 8", as well as complete cutting instructions. These mini-patterns, however, are intended for those with some paper piecing experience, as step-by-step instructions are not included. 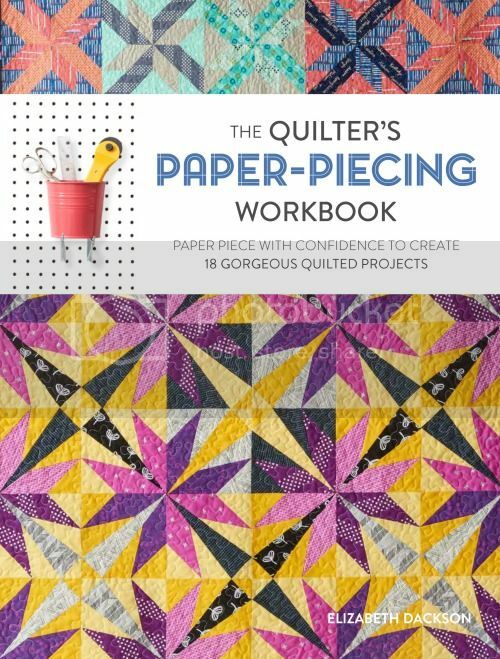 If you've done more than a block or two with paper piecing, you've probably noticed that the process of paper piecing does not change from block to block, the technique is identical, so that's precisely why I'm introducing these mini-patterns. Quick and easy fun paper pieced blocks are a great way to add some fun pizzazz to a zipper pouch or a tote, or to use in a mini quilt! Each mini-pattern also includes a piecing diagram to show you exactly where each piece in the block winds up. Love the idea of paper piecing but haven't given it a try yet? Stay tuned tomorrow for the official release of my newest Craftsy class, Start Paper Piecing! I'm super excited to share the projects with you all. Have a fantastic day! Goodness gracious, how is it already the second week of November?! Deadlines and work has been fast and furious over the last several weeks, hence my absence here around the blog, but I'm trying to get back into the swing of writing and setting up posts in advance. First up is catching up with the Lucky Stars Block of the Month Club! I also made an Arcadian Star for Spring Market for Robert Kaufman, with a bit of a different look. I'm not usually much of a purple fan, but I really like it in this block! We've got just one more Lucky Star Block of the Month coming up, for December, and that will be a wrap on the Lucky Stars Block of the Month Club! Not a member yet? No worries, you can still join in the paper piecing fun right here. And not to worry, I do have some new paper piecing patterns coming very soon through my brand new Craftsy class, Start Paper Piecing, which will be coming out later this month. Stay tuned! !